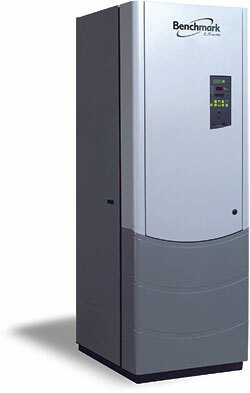 The Benchmark 1.5 Low NOx condensing, fully modulating boiler has an operating range of 75,000 to 1.5 million BTU/hr and matches fluctuating loads. Incorporates a stainless steel heat exchanger and the company’s C-More unit controller to deliver a 20:1 turndown. Measures 79 inches high by 28 inches wide by 36 inches deep.